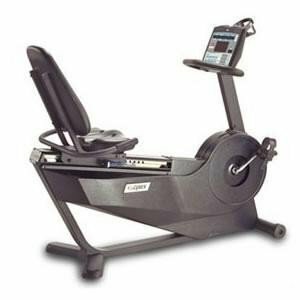 Cybex is well known for their superior quality, and the Remanufactured 700r recumbent bike is a great example of this. It's a commercial grade machine that's been remanufactured for in-home use at a significantly lower price than a new, commercial version. There just aren't very many manufacturers out there that make a top quality recumbent bike; Cybex is one of the few companies that puts as much thought into a recumbent as they put into an upright exercise bike. Their machines are manufactured to exacting standards with forged steel frames and top quality parts to last for years. UPDATE: The 700r has been discontinued and replaced with a newer model. You can check out all of the latest Cybex exercise bikes here. Users who have purchased a Cybex Remanufactured 700r recumbent bike are universally happy with this powerful machine because they're getting a commercial grade machine that will last for years without shelling out the high price tag of a brand new model. The remanufacturers of the Cybex 700r recumbent bike do an excellent job, completely dismantling the entire unit and rebuilding it from the ground up. During this process, they restore the overlays, paint and give the bike a new drive belt, chain and hardware before cleaning and polishing the entire machine. Online reviewers say that the process gives them a recumbent exercise bike with all of the benefits of a new model, but at a relatively lean $1600. There are very few complaints about the Cybex 700r. You might see a few minor comments about the warranty coverage, but because they are remanufactured, that's a problem with the remanufacturing company, not Cybex, and most owners concede that they've never had to test the warranty because the machine doesn't break. With a 400 pound weight limit, you just can't find anything sturdier on the market, either for in-home or commercial use. There is a reason companies take the time to remanufacture Cybex machines for the at-home user - these exercise bikes last forever. The beauty of buying a Cybex Remanufactured 700r recumbent bike is that you're paying in-home prices for a commercial machine. Everything from the easy to read console to the wide range of programs screams "commercial grade." These are sleek, powerful recumbent bikes that will be comfortable for anyone from the first time biker to the serious athlete who needs to use a recumbent bike after an injury. Whether you're in rehabilitation, are training for a gruelling marathon or you simply want to shed some pounds and tone up, the three performance levels (biking, constant power and isokinetic) and wide range of power options delivers on all levels. Only you can determine whether the $1,600 price tag is worth it, but we love the Cybex Remanufactured 700r recumbent bike and can't say enough about its comfort, design and performance.